Note: Domestic orders exceeding A$1000 receive free shipping. Your use of this website (Teletech.com.au) constitutes acceptance of all terms and conditions listed on this page and on other pages of this website. If you do not agree with any or all of the terms and conditions you must seek clarification and discontinue use of this website. Any information listed on this website should not be substituted for professional, legal, financial or educational advice and all information is provided as a guide ONLY. All information is provided in good faith and any more thorough information required should be investigated before engaging in any actions or decisions based on the information provided in this website. All information provided on this website is strictly subject to copyright as permitted by Copyright Act 1968. Teletech Pty Ltd will allow the ability to view and download copyright documents from our website and linked for private purposes only, not commercial in any form. Written permission must be obtained from a director of Teletech Pty Ltd before any copyright material may be reproduced or quoted in part or in full for any purpose other than private only. Teletech Pty Ltd, its directors and/or employees will not be held responsible for any damage or harm caused by improper use of products caused by any information obtained through this website, third party websites, companies or businesses except where to do so would in any part of these terms become illegal, void or cannot be enforced. Teletech Pty Ltd makes no warrants for its products for any particular purpose. Teletech Pty Ltd will not be liable for disruptions to this website and is not liable for any damage or harm caused by the use of this website to your computer, self or any possessions you may have under any reasonable circumstance. Any links into this website and it's sub-pages from other people or entities is encouraged, however, doing so creates no liability to Teletech Pty Ltd for any inaccurate or out of date information obtained. Please obtain permission from Teletech Pty Ltd before linking any pages. Whilst Teletech Pty Ltd seeks to ensure all products are available at the time of purchase and shipped within a reasonable time frame of availability. Most in-stock products are shipped the same day. If we are unable to ship within 3 days we will inform you. In the event a product must be re-ordered you will be notified as to the length of time required and any other time delays caused by third party businesses. We may choose to refund you an amount if the delay is unreasonable. Additionally products listed as in stock on this website may have a small number available. We recommend contacting us before any significant purchase to ensure the product will be available within your required time frame. Any personal information provided to the Teletech Pty Ltd website will be stored in our database. We do not share any of your personal information, including, but not limited to, your full name, your address, your phone number, your email address or your order to any marketing businesses for any purposes. With your confirmation, your name and contact phone number may be passed onto a business for purposes only to do with your requirement. For example, providing a courier service information to deliver the product(s). All information on this website has been obtained through due research and investigation and is provided in good faith. Teletech Pty Ltd will not be held liable for any inaccurate information provided by manufacturers of non-Teletech manufactured products. All relevant standards testing, approvals, documentation and any applicable requirements for the sale of any product in Australia are held by Teletech Pty Ltd. Teletech Pty Ltd, however will not be held liable for any damages or harm caused by any inaccuracy of any information on this website or any third party websites, businesses or companies. All products purchased through Teletech Pty Ltd should be used in accordance with any relevant standards and processes made by the governing bodies for the state or country in which the product is to be used. Teletech Pty Ltd will accept no liability for any damage, loss or harm to any possession(s) or person(s) for the improper use of any product(s). All shipping prices are calculated including any handling fees. The price will vary depending on the service chosen. Regular Australia Post shipping will be utilised on most small orders and a Courier Service will be used on larger orders. We can also ship using the customers selected courier. We are happy to credit or exchange any unopened goods within 14 days of delivery, provided that we receive the goods in original condition. Returns will be approved at our discretion and all postage costs are to be incurred by the customer. If the returned item is damaged upon receipt, we will be unable to accept the goods, and they will be returned to you. Please email returns@teletech.com.au with notification of and reason for the return. We will respond with instructions on how to proceed. Should you receive a faulty or damaged product, please email sales@teletech.com.au with your specific problem and we'll get back to you promptly. 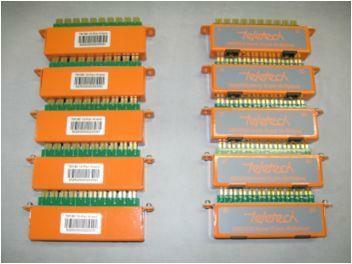 Teletech Pty Ltd provides a 12 month warranty for its products. The warranties do not cover any product that has been misused, abused, improperly or poorly used or disassembled. The warranty covers any product that becomes defective under reasonable normal usage as determined solely by Teletech Pty Ltd.
By purchasing any product or service from Teletech Pty Ltd you are agreeing to the terms and conditions set out in this documentation and others provided in any other terms and conditions page on this website. All products will remain property of Teletech Pty Ltd until they have been paid for in full by the customer (you). We are not required to deliver any product or service until payment has been made in full unless prior agreement has been obtained in writing. All prices are quoted in Australian dollars (AUD). For any further clarification on any of the terms on this website, please contact us. THE INFORMATION CONTAINED ON THIS WEBSITE IS USED AT YOUR SOLE DISCRETION. TELETECH PTY LTD WILL NOT ACCEPT ANY LIABILITY FOR ANY DAMAGES, LOSSES OR HARM CAUSED IN CONNECTION TO ANY PRODUCTS OR INFORMATION OBTAINED FROM THIS WEBSITE. Multiplexers are a tool used for mapping pairs against telephone services. Ganged together they make the mapping process quicker and more accurate. The multiplexers are connected to TX380 instruments. Each TX380 is capable of connecting with up to 100 pairs via multiplexer shoes. In this way it is possible for a single operator to scan, test and map several hundred pairs per hour. The multiplexers are the interface between the TX380 test instrument and the network pairs. The multiplexers enables the TX380 to test each pair in turn. This eliminates error. A different multiplexer type is required for each of the different manufactures of telecommunication connectors. No images are available for this product.